I would just like to thank you for a wonderful product, the tangles take me back to when I was a teen, [ . . . ] and now, I find myself going back to black and white work. These tangles help me to forget my worries for a while. P.S. The attached is a 4 tile Zentangle I did this morning. Beautiful! Thanks for sending that "C."
This is another great example of applying our Ensemble approach. Congratulations. One of our design intentions behind why we die-cut our tiles is to support how Zentangle tiles fit together to form a mosaic. 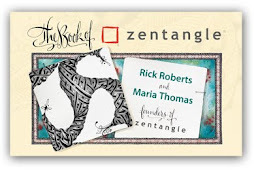 The seed for this idea was planted when Molly put Rick's jeans through the wash with some Zentangles still in the pockets. They came out still looking great (another benefit of using this combination of tile and pen), but with nice rounded corners and soft edges. If you recently started reading this blog, be sure to check out Molly's "Naptime" Ensemble series which is based on one of the Ensemble sets that we provide. You must have had a really wonderful morning, C! A beautiful way to start the day.